Check this section of our website often so you don't miss the special deals, promotions, discounts, giveaways and more. You can also sign up to our newsletter so you are one of the first ones knowing about all the good events happening on our website. We are upgrading our UK Standard 3-5 working days delivery to only 2-3 days (including weekend) within UK this Christmas (subject to availability, exclusions apply). Order by noon on Friday 21st of December, select 'UK Standard Delivery' and receive your parcel before Christmas with no extra charge for express delivery. Please ensure to be available to accept your parcel on Monday, December 24th. This offer is not valid in conjunction with any other Minideco offers. This '10% off TOYS’ offer applies to all items from our TOY category only except items from brand 'Wildfire Teepees'. It is valid from November 23rd, 2018 till November 25th, 2018 (expires at 11.59 p.m. on November 25th, 2018. All other products and Minideco Gift Vouchers are excluded from this offer. This offer is not for re-sale or publication. Previous purchases are not eligible for this offer. This offer applies only to personal orders; orders that are considered to be commercial may be excluded from the offer. All orders are subject to acceptance under Minideco's standard terms and conditions. You can find our standard terms and conditions here. Enjoy your bank holiday weekend with a little treat from us. 20% off everything from our 'room decor' category. It's time to refresh your little one's room. Discount code is valid until midnight on Monday, May 28th, 2018. 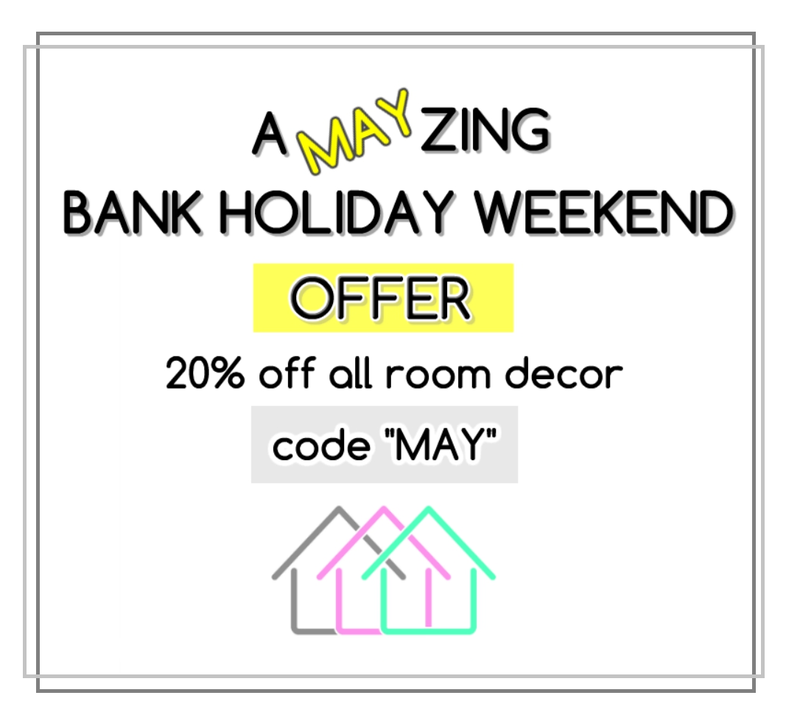 This '20% off ROOM DECOR’ offer applies to all items from our ROOM DECOR category only except items from brand 'Wildfire Teepees'. It is valid from May 25th, 2018 till May 28th, 2018 (expires at 11.59 p.m. on May 28th, 2018. All other products and Minideco Gift Vouchers are excluded from this offer. This offer is not for re-sale or publication. Previous purchases are not eligible for this offer. This offer applies only to personal orders; orders that are considered to be commercial may be excluded from the offer. All orders are subject to acceptance under Minideco's standard terms and conditions. You can find our standard terms and conditions here. 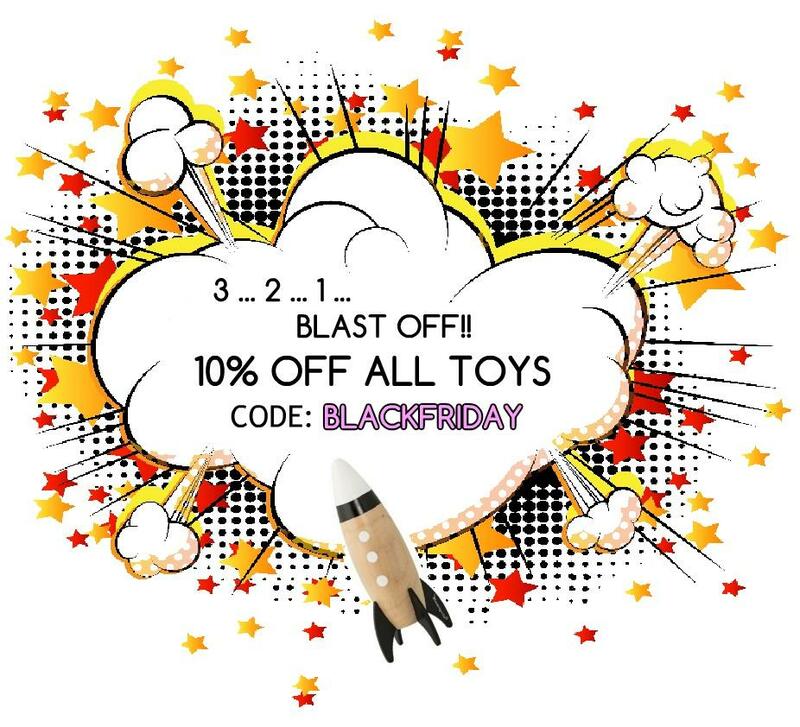 As Christmas is approaching very quickly, we thought that you might appreciate a small promotion and enjoy 10% off all toys from our website while shopping for presents for your little ones. 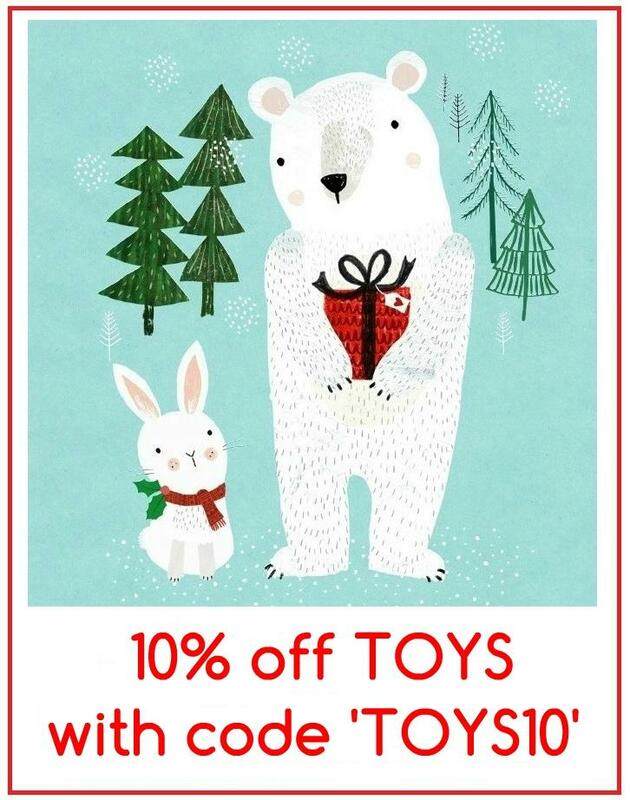 This '10% off TOYS’ offer applies to all TOYS only except 'Teepees'. It is valid from November 1st, 2017 til November 30th, 2017 (expires at 11.59 p.m. on November 30th, 2017. All other products and Minideco Gift Vouchers are excluded from this offer. This offer is not for re-sale or publication. Previous purchases are not eligible for this offer. This offer applies only to personal orders; orders that are considered to be commercial may be excluded from the offer. All orders are subject to acceptance under Minideco's standard terms and conditions. You can find our standard terms and conditions here. 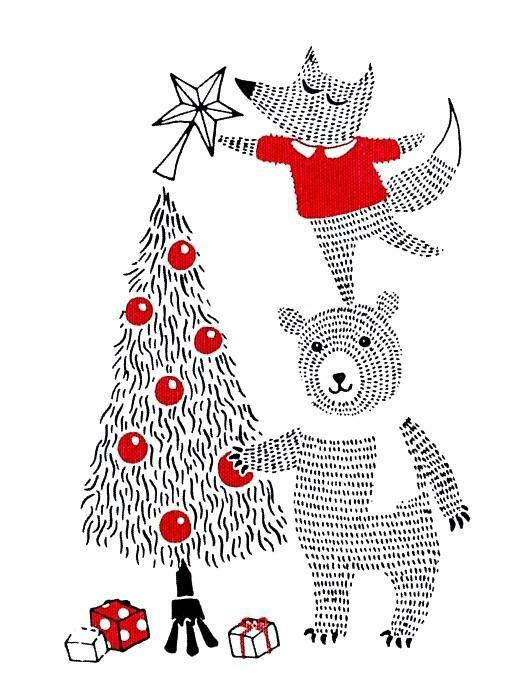 Christmas postcard design by Rebecca Jones for Petit Monkey. Please find our selection of beautiful Petit Moneky post cards here. MINIDECO IS 1 YEAR OLD! Thank you ever so much to each one of you, our lovely customers, for your orders and support. We wouldn't be able to do it without you! from the bellow image / our latest Instagram post worth over £680! Make sure you follow our Instagram account, 'Like' the IG giveaway post and add two friends underneath the post. 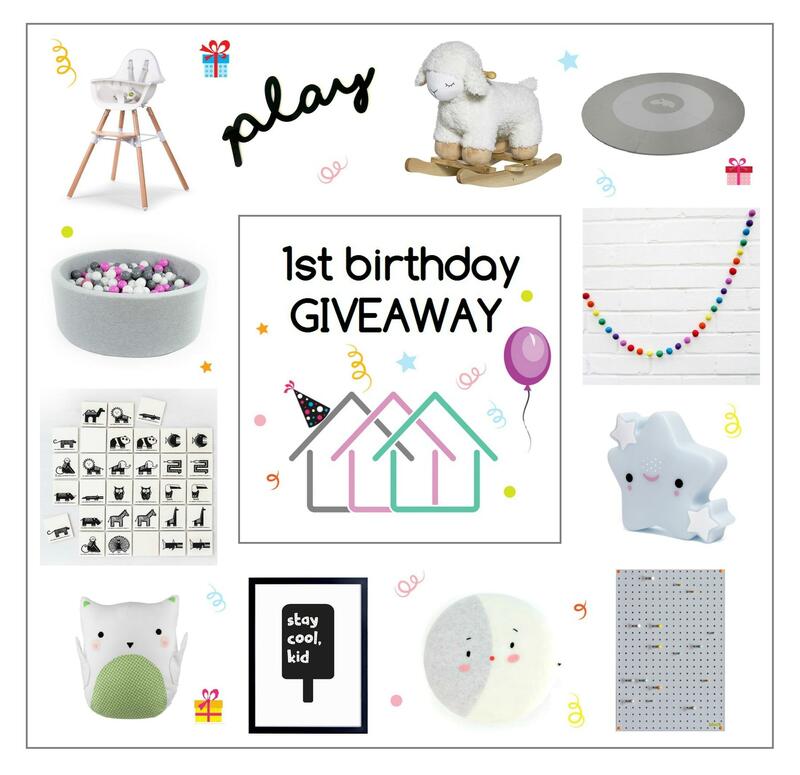 The birthday Giveaway ends on Tuesday 17th of October at 8pm. The winner will be randomly chosen and announced within 24 hours of the competition closing. 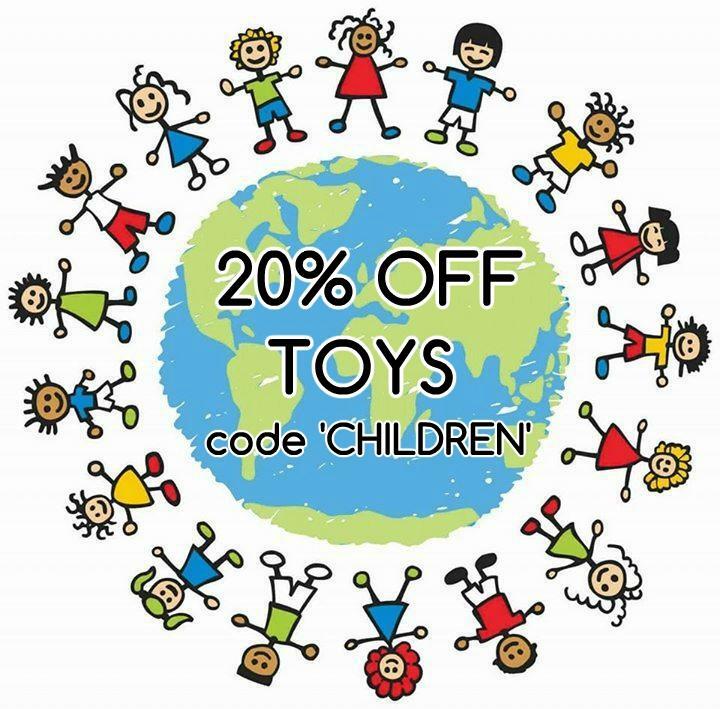 This '20% off TOYS’ offer applies to all TOYS only except 'Teepees'. It is valid on June 1st, 2017 only (expires at 11.59 p.m. on June 1st 2017. All other products and Minideco Gift Vouchers are excluded from this offer. This offer is not for re-sale or publication. Previous purchases are not eligible for this offer. This offer applies only to personal orders; orders that are considered to be commercial may be excluded from the offer. All orders are subject to acceptance under Minideco's standard terms and conditions. You can find our standard terms and conditions here. 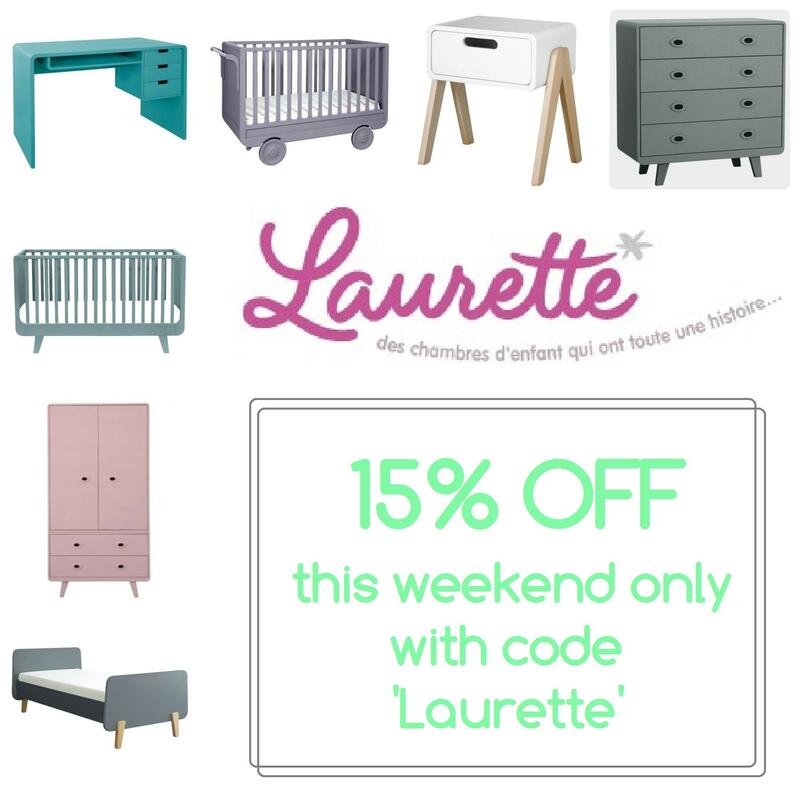 This '15% off all Laurette’ offer applies to all products from brand 'Laurette' only. It is valid from May 26th, 2017 and expires at 11.59 p.m. on 28th of May 2017. All other brands, Minideco Gift Vouchers, Sale and Clearance items are excluded from this offer. This offer is not for re-sale or publication. Previous purchases are not eligible for this offer. This offer applies only to personal orders; orders that are considered to be commercial may be excluded from the offer. All orders are subject to acceptance under Minideco's standard terms and conditions. You can find our standard terms and conditions here. 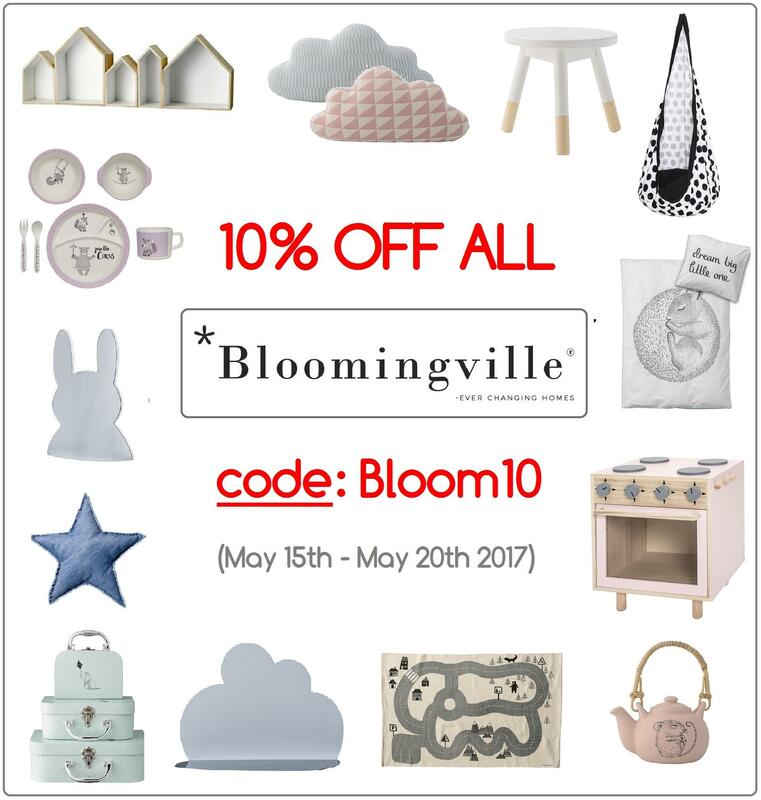 This '10% off all Bloomingville’ offer applies to all products from brand 'Bloomingville' only. It is valid from May 15th, 2017 and expires at 11.59 p.m. on 20th of May 2017. All other brands, Minideco Gift Vouchers, Sale and Clearance items are excluded from this offer. This offer is not for re-sale or publication. Previous purchases are not eligible for this offer. This offer applies only to personal orders; orders that are considered to be commercial may be excluded from the offer. All orders are subject to acceptance under Minideco's standard terms and conditions. You can find our standard terms and conditions here. ! ! ! ! e x p i r e s o n M o n d a y, M a y 8th ! ! ! ! Due to the introduction of new ball pits on our website, we are giving you a special 10% off all ball pits in our offer. Choose your color, number of balls, add the code and have hours of fun! The ball pits are CE certified, made in Germany and loved by children of any age. This '10% off ball pits’ offer expires at 11.59 p.m. on May 8th, 2017. This offer is valid for ball pits only. This offer is not for re-sale or publication. Previous purchases are not eligible for this offer. This offer applies only to personal orders; orders that are considered to be commercial may be excluded from the offer. All orders are subject to acceptance under Minideco's standard terms and conditions. You can find our standard terms and conditions here. ! ! ! ! O N E D A Y O N L Y ! ! ! ! Due to the introduction of this amazing brand on our website, we have a quick 'one day' but truly special promotion. Get 20% off all wall stickers from Dekornik. All their wall stickers are manufactured using the best quality materials, in-house, with passion and attention to detail. This '20% off wall stickers from Dekornik’ offer is valid on 19th of March, 2017 only and expires at 11.59 p.m. on March 19th, 2017. This offer is valid for the one brand only. This offer is not for re-sale or publication. Previous purchases are not eligible for this offer. This offer applies only to personal orders; orders that are considered to be commercial may be excluded from the offer. All orders are subject to acceptance under Minideco's standard terms and conditions. You can find our standard terms and conditions here. Let's make February fabulous and add some special discount to your order. Exclusions apply. This '10% off your order’ offer expires at 11.59 p.m. on February 28th, 2017. All products from 'Done by Deer', 'Jupiduu', 'Smallstuff', 'Turkusowa Pracownia', Minideco Gift Vouchers, Sale and Clearance items are excluded from this offer. This offer is not for re-sale or publication. Previous purchases are not eligible for this offer. This offer applies only to personal orders; orders that are considered to be commercial may be excluded from the offer. All orders are subject to acceptance under Minideco's standard terms and conditions. You can find our standard terms and conditions here. This '10% off your first order’ offer expires at 11.59 p.m. on 31st of December 2016. All products from 'Done by Deer', Minideco Gift Vouchers, Sale and Clearance items are excluded from this offer. This offer is not for re-sale or publication. Previous purchases are not eligible for this offer. This offer applies only to personal orders; orders that are considered to be commercial may be excluded from the offer. All orders are subject to acceptance under Minideco's standard terms and conditions. You can find our standard terms and conditions here. This '15% off all Sebra’ offer applies to all products from brand 'Sebra' only. It is valid from October 31st, 2016 and expires at 11.59 p.m. on 5th of November 2016. All other brands, Minideco Gift Vouchers, Sale and Clearance items are excluded from this offer. This offer is not for re-sale or publication. Previous purchases are not eligible for this offer. This offer applies only to personal orders; orders that are considered to be commercial may be excluded from the offer. All orders are subject to acceptance under Minideco's standard terms and conditions. You can find our standard terms and conditions here. This '20% off all house beds' offer applies to all products from brand 'Benlemi' only. It is valid from October 25th, 2016 and expires at 11.59 p.m. on 31st of October 2016. All other brands, Minideco Gift Vouchers, Sale and Clearance items are excluded from this offer. This offer is not for re-sale or publication. Previous purchases are not eligible for this offer. This offer applies only to personal orders; orders that are considered to be commercial may be excluded from the offer. All orders are subject to acceptance under Minideco's standard terms and conditions. You can find our standard terms and conditions here.